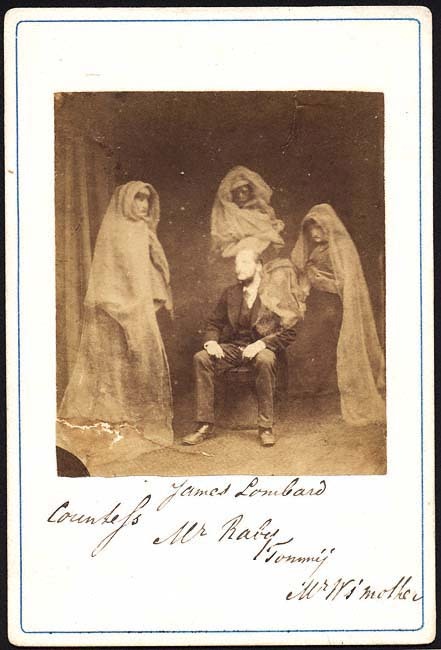 Mr. Raby with the Spirits "Countess," "James Lombard," "Tommy," and the Spirit of Mr. Wootton's Mother. Obtained by Messrs. Raby Wootton & Rutherford at Hudson's Studio. At a Seance at Mr. Wootton's the spirits desired him to go to Hudson's promising they would try to produce their likeness. Mr. W. did so, accompanied by his friends. The gentlemen operated [i.e., took the photograph] themselves without allowing Hudson to take any part in the manipulations. The result was exactly as the spirits had told beforehand it would be. Mr. Raby sat and the spirits "Countess," "James Lombard," "Tommy," and Mr. Wootton's mother appeared when the plate was developed. Frederick A. Hudson was England's first spirit photographer. His earliest results were obtained in 1872. The editor of the British Journal of Photography investigated the following year, bringing his own plates and chemicals, and could not come up with an explanation. Dr. Alfred Russel Wallace, who shares credit with Charles Darwin for the discovery of evolution, was a client of Hudson and obtained two different photographs showing his deceased mother.